We all have that one thing that we are working up to… and that one thing that terrifies us for no real reason. We know we can do it… but…. One of the wonderful groups I follow on Facebook has inspired me to give some tips for mentally preparing to face your fear. Many of the riders in the group were expressing their fears of cantering or cantering a new horse. This is a VERY common issue for students. There is something about the upward transition that paralyzes riders. Other common fears are: beginning to jump, moving the jump from a cross rail to a vertical, moving up a division in the show ring, and riding a new horse. For some reason, all of skill acquired until this transition point just goes out the window and the rider simply forgets to ride. Fear can be a powerful thing. But, you guys are equestrians. There is nothing more powerful than a person who chooses to sit on a 1000+ lbs. animal and control it with their legs. You are already daring, confident and capable. Never forget that! First thing is first, when tackling a fear… BREATHE!!!!!!!!! (Can I add some more !!!!!!!!!!! please?) Breathing relaxes you AND your horse. Before you even start your transition or course, do yourself a favor and exhale. Tension in the rider creates tension in the horse, relaxation in the rider promotes relaxation in the horse. So many riders forget to breathe. To help you with your breathing and your steady rhythm, I suggest you COUNT or even sing. You can’t hold your breath and sing! By counting or singing, you are helping yourself track your pace. If you are counting, you are less likely to speed your motion (for example, your post) when your horse speeds up- your horse will be more likely to match your pace. You will have more control. Before you even begin your transition, don’t forget to ride. REMEMBER YOUR BASICS. Are your heels down? Are your eyes up? Are your sitting up? There are really great reasons for great position and equitation- most importantly, stability. You can handle anything if your heels are down and you are balanced. The most feared thing among riders is falling. You fall because your balance is thrown off, and generally, your balance gets thrown off easier when your heels come up!! Often fear and “forgetting to ride” comes from over thinking what you are about to do. TAKE PRESSURE OFF YOURSELF. Rome wasn’t built in a day, as the saying goes. Or as my students often hear me say: Everyone is one their own journey. 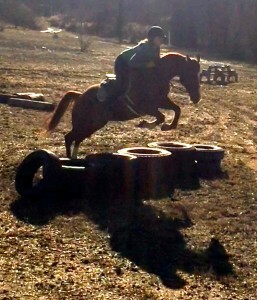 If you canter for ONE step and you were scared of cantering, THAT is a victory! Don’t feel like you have to canter all the way around the ring or jump a course of the height you are trying to move up to. Baby steps, small victories, good foundations, and several confidence building rides make “moving up” much less daunting. Many riders are perfectionists- but you don’t achieve perfection the first time you do something; it takes practice. Allow yourself to make a mistake (or three). Finally, remember…. RIDING IS FUN. For many riders, riding is what they do for “fun.” It is done in your “spare” time. (I am using quotes, because many of us view riding as necessary as breathing.) If you aren’t enjoying your rides, change something!! Get out of the ring. Go for a trail ride. Test a different discipline. Ride simply for the love of riding. When you are enjoying yourself, sometimes things just happen naturally. I had one student tell me that she never jumped before and she was a little nervous about trying a “real” jump. I burst into laughter because the week before, we were on a trail ride, and she followed the horse I was riding right over a “real” log jump! She was having so much fun, she forgot to build up the jump into a big huge event. And guess what? Her timing was perfect and natural. So, next time you are feeling nervous, remember to breathe, count, utilize your basic foundation, take the pressure off yourself, and HAVE FUN!! !